Cosmotronics provides Hosted PBX plans for small to medium sized businesses to suit your budget. Our feature plans provide more than just basic VOIP services. We include a free handset, unlimited exchange mailbox, Enterprise Lync instant messaging, McAfee Advanced Email Protection, Activesync, ShareSync and unlimited local and long distance calling in our Hosted PBX packages. 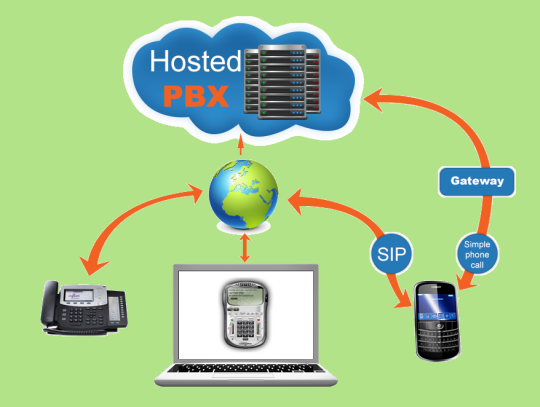 Hosted PBX is a cost effective way for smaller businesses to utilize VOIP (Voice-over-IP) technology with a much smaller investment in setup, fees and hardware. You can now work from any location with a phone line while still being connected to the same office telephone system. You have the ability to transfer calls, create hold music, set up conference calls or create an automated attendant to send calls to the right extension. We have a full suite of Hosted PBX desk phones and conference phones available for multiple business purposes. The Polycom product line of desk phones we offer includes full user features and anywhere from 2 to 10 lines depending on the model you choose. The Cisco line of VOIP phones are a great affordable solution for a home office IP phone setup, giving you reliable sound and a high quality experience. We understand the importance of choosing the right phone for your business needs. To see the product features and specifications of the Hosted PBX phones Cosmotronics offers, click the download button below.